We, at Investment Title, live and breathe Title, which means we have seen it all. As a team, we agreed on some of the most common scenarios that have occurred and need to be addressed before your file can close. Remember, even though this house may be new to you, that doesn’t mean the property doesn’t come with baggage, so if you are contemplating the need for title insurance, just do it! We aren’t just saying that because it’s our business, we are saying that because it is truly worth the expense order to secure the property and home that you have worked hard to get. Protect your (potentially) largest investment! Now, on to the problem list! 1. Liens and Judgments: If you don’t know what these terms mean, don’t worry; we can explain. If someone owes money to another person (lienholder), then the lienholder can become the owner of the debtor’s property until it is fully paid off. The judgment lien can be imposed on your property only after somebody sues you and wins a money judgment against you. Then the person or company who won would have to file the judgment record with the state or county depending on where you reside (laws vary by state). Liens and judgments cannot be removed from the property until whatever is owed is paid off and the lien satisfaction is filed of record. It is best to be proactive in situations rather than waiting to handle this situation until closing day. Call your title company and ask them what the best way to resolve the property’s lien issues if there are any. 2. Estate Related Issues: Another common problematic scenario relates to family estates. An estate is a large property or house that is usually owned by a family, therefore it would be passed down to the heirs of the property in the future. Making sure that an estate that is selling a property is properly extinguishing the interest of all heirs is very important. Although if the heir is unknown or cannot be found the property can be sold, you do not want to have to worry about a family member coming out of the woodwork claiming rights to your property. Another estate related issue that could arise relates back to issue #1, all applicable taxes need to be paid off so there are no liens on the property when you (the new owner) takes the title. 3. Foreclosure and Bankruptcy Issues: Once again going back to those pesky liens: if any of the prior owners have been through bankruptcy or foreclosure your title company needs to make sure all creditor’s interest have been properly addressed, so they no longer have a lien on the property. An example of this is if the seller bought the house while single and later married someone with a recent bankruptcy. Your title company will be responsible for making sure the spouse signed off on the deed and that the bankruptcy has been discharged. If not, the property could still be considered a frozen asset by the bankruptcy trustee and your closing could be delayed or worse, denied approval and you would not be able to purchase the property. 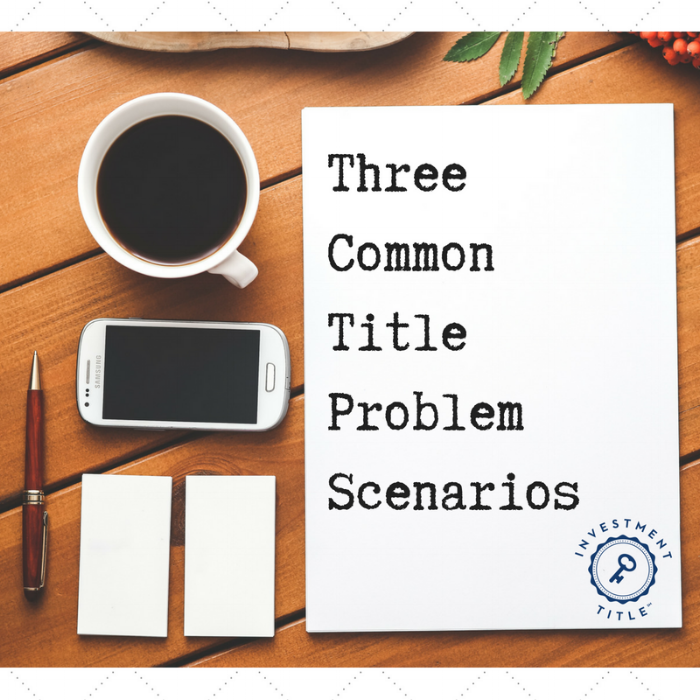 While these are the top three scenarios that we found most common at Investment Title, there are a lot of other situations that occur before a file is closed. Each company is different and experiences different things. This blog could go on forever with all the different scenarios, but we’ll keep it short for your sanity and ours!